Flipping channels late last night, I wandered through the 1000s, where a lot of interesting on-demand channels live unbenonced to most of us (or me, at least). Time Warner offers a free movies-on-demand, most of which are obscure indie titles. One of them is Childstar, a 2004 Canadian film from exceedingly talented writer/director/star Don McKellar, whose resume includes the screenplay for 32 Short Films About Glenn Gould, 1999's little-seen but fantastic apocalypse dramedy Last Night and, most recently, the book for the genuinely funny Tony-nominated musical The Drowsy Chaperone. In Childstar, McKellar plays a indie filmmaker who pays the bills as a driver for bigger productions. Working on The First Son (where Canada is once again subbing for the US), he ends up becoming the driver/tutor/lifecoach for a spoiled 12-year-old American actor. He also ends up sleeping with the kid's mom, played by Jennifer Jason Leigh. In Hollywood, this premise would have become something like The Toy or Life with Mikey, but Childstar is typical McKellar -- dry, funny, adult, and more than a little weird. I recommend it. This got me thinking about what I consider to be McKellar's finest hour, Twitch City, the short-lived 1998 CBC "sitcom" (not really the right word) that he created and starred in. McKellar plays Curtis, an agoraphobe and TV addict who hasn't left his apartment in a very long time. Spending most of the time watching sleazy gab-fest The Rex Reilly Show (Kids in the Hall fans alert: Rex is played by Bruce McCulloch in the first season; Mark McKinney in the second) and precious little else, he's not the most likeable person... at first. In fact, his roommate is Nathan, an OCD-freak obsessed with "chore wheels" hates Curtis with a passion and would wield a little more power in the apartment if his girlfriend (Molly Parker, now of Deadwood) wasn't currently freeloading. In the first episode, Nathan is sent to prison for murder, opening the door for a revolving series of increasingly bizarre roommates, including a cat-hating psycho and Japanese mobster who uses the room to store highly-addictive cookies. 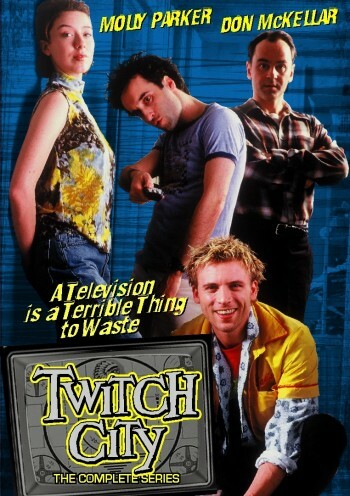 Twitch City was a surreal, weird and very funny examination of our obsession with televison (and cats), and featured a handful of cool guest-stars over the 13 episodes that comprised its two seasons, including Jennifer Jason Leigh, rock band Sloan, and, uh, Joyce DeWitt. Bravo aired the series in America a year later sometime in 2000 which is where I saw it and became obsessed. I still have the videotape i made of the first season, one of the few tapes I still keep… even though my VCR died a year ago and have no plans of replacing it. Doesn't look like I'll need to, either, as Twitch City is finally being released on DVD -- albeit in Canada, but their DVDs play in American machines -- on October 17. Extras are few (commentary tracks for a couple of episodes) but having physical proof of this fantastic series that only I seem to have seen (amongst those I know) will be enough for me. You can order it through Amazon Canada. I have been waiting for this for a long time. Curious but not sure? Watch the first episode of Twitch City on YouTube (in three sections).